Sydney Miti's family spoke Saturday night about the flight instructor who was one of two people killed in a crash at the Mansfield Municipal Airport earlier in the day. A flight instructor and his student were killed Saturday when a single-engine airplane crashed nose-first into the ground at Mansfield Municipal Airport. Mansfield police say Sydney Miti, 31, of Waltham, and Julian Lattermann, 18, of Dover, were both killed upon impact. "Our thoughts and prayers are with the victims and their families during this tragic time," Mansfield police said in a statement. 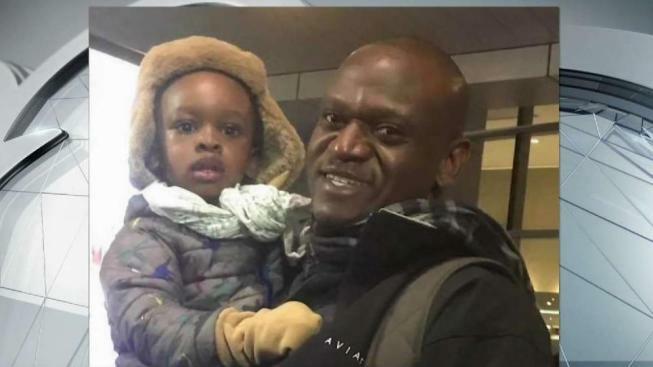 Miti's family tells NBC10 Boston it was his dream to fly, and all of his nephews wanted to be like him. The pilot's grieving family celebrated his life at a vigil Saturday night where his mother and wife described his contagious positivity and kindness. "I was so worried," Gertrude Miti said of her son's profession. "I said Sydney, 'why did you take this job?' It's too risky for you, it's too risky." Miti's mother describes him as a loving, friendly, and kind father, son, husband, uncle, and brother. "Everybody loved you Sydney, everybody loved you. You know that," Gertrude Miti said. An initial investigation shows Miti was giving Lattermann a lesson aboard a 2002 Cessna 172S aircraft on Saturday. It was in the Mansfield area after having taken off from the Norwood Airport around 11:26 a.m. The Mansfield Police Department communications center received multiple 911 calls reporting the accident around 12:30 p.m. When emergency crews responded, they found the plane had crashed into the ground at runway 4, the turf landing strip located on the north side of the airport adjacent to Fruit Street. Police say a radio transmission from the aircraft indicated a missed approach as it maneuvered away from Mansfield runway 32. Moments later, the Cessna flew past the Municipal Airport administration building and crashed into the turf landing area. "I just came by and saw all the commotion so I stopped," said Mansfield resident Ginnie Boucher, whose husband is a private pilot. "If they had mechanical trouble, they did a good job getting back to the airport and staying away from all the residents and the bikes." Miti and Lattermann were the only ones on board when the aircraft crashed nose-first into the ground, crushing the cockpit. "It's really not good," said Boucher who lives near the airport. "Nose-first, and it seems to be buried all the way up to the seats." "It's shocking," adds Paul Bjorkman, who rents a small plane and flies out of the Mansfield Airport all the time. Bjorkman says he can't figure out what happened. Federal investigators used a drone to help them piece together how it all unfolded. Mansfield firefighters responded to the scene and sprayed the plane with foam to mitigate the dangers of leaking fuel while the victims were extricated from the wreckage. The scene was cleared around 6 p.m. and the aircraft was turned over to investigators from the Federal Aviation Administration and the National Transportation Safety Board. The FAA is investigating, and the NTSB will determine the probable cause of the crash. Mansfield and Massachusetts State Police detectives are assisting in the investigation. The aircraft was owned and operated by Horizon Aviation, of Norwood. The company declined to comment Saturday night.